The Parabol is a 25-kilowatt-electric (kWe) solar dish system that simply takes the energy from the sun and converts it into grid quality energy. It’s pure power made simple. The technology uses no fuel, is emissions free, and uses less water than other solar technologies; providing a clean, efficient, reliable source of energy. The Parabol is the result of more than a decade of innovative engineering and validation testing, with hundreds of thousands of hours of on-sun testing on each major sub-system, and over 50,000 hours on-sun testing for the complete system. 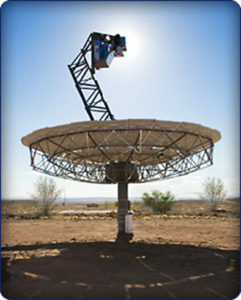 Each Parabol is powered by its own solar dish engine. The solar dish technology is well beyond the research and development phase, with more than 20 years of recorded operating history. The equipment is well characterized with over 50,000 hours of on-sun time. Since 1984, the Solar Dish equipment has held the world’s efficiency record for converting solar energy into grid-quality electricity. 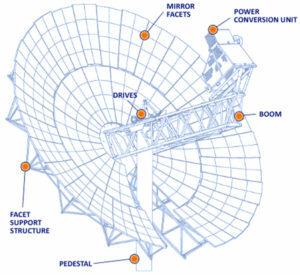 The Parabol is a 25-kilowatt-electrical (kWe) solar dish system which consists of a unique radial solar concentrator dish structure that supports an array of curved glass mirror facets, designed to automatically track the sun, collect and focus, that is, concentrate, its solar energy onto a patented Power Conversion Unit (PCU). The PCU is coupled with, and powered by, a completely re-engineered engine that generates power grid-quality electricity. The PCU converts the focused solar thermal energy into grid-quality electricity. The conversion process in the PCU involves a closed-cycle, high-efficiency four-cylinder, reciprocating Solar Engine utilizing an internal working fluid that is recycled through the engine. The Solar Engine operates with heat input from the sun that is focused by the dish assembly mirrors onto the PCU’s solar receiver tubes which contain hydrogen gas. The PCU solar receiver is an external heat exchanger that absorbs the incoming solar thermal energy. This heats and pressurizes the gas in the heat exchanger tubing, and this gas in turn powers the Solar Engine. A generator is connected to the Solar Engine; and produces the grid-quality electrical output of the Parabol. Waste heat from the engine is transferred to the ambient air via a radiator system similar to those used in automobiles. The gas is cooled by a radiator system and is continually recycled within the engine during the power cycle. The conversion process does not consume water, as is required by most thermal-powered generating systems.